Geometry brings into play various spaces, such as Riemannian, Kähler or symplectic manifolds, graphs, and moduli spaces. By nature, it is intricately linked with many other mathematical fields, particularly Algebra, Topology and Group Theory. For more than a century, close interactions with dynamical systems have developed, as geometry has been providing examples such as billiards, geodesic flows, Hamiltonians, the Ricci flow, etc. The study of such dynamical systems and their asymptotic properties has turned out to be a powerful tool in solving geometric problems, beautifully illustrated by the proof by Grigori Perlman of the Poincaré Conjecture using the Ricci flow on 3-dimensional manifolds. 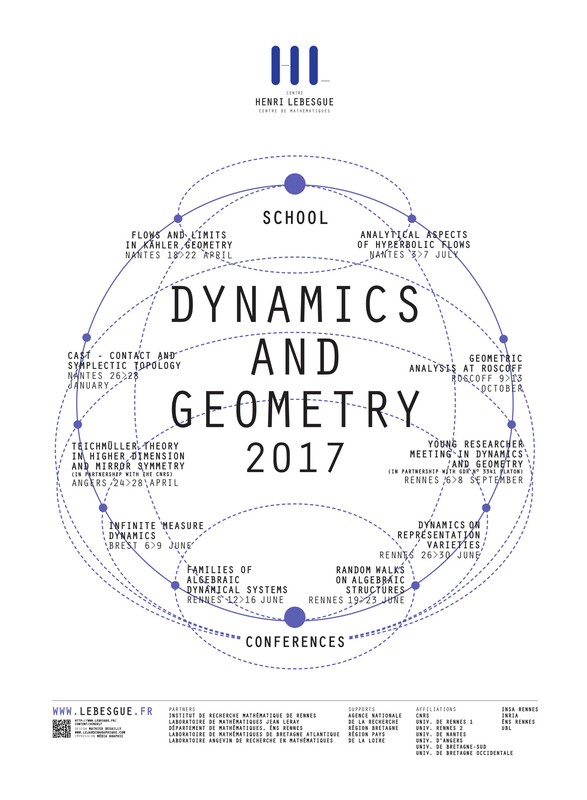 The semestre "Dynamics and geometry", organized by the Centre Henri Lebesgue, will present recent progress around this interaction between dynamical systems and geometry, bringing together many international experts on the topic. It will also offer several conferences together with mini-courses, in order to make these topics accessible to a broad audience, including young researchers.